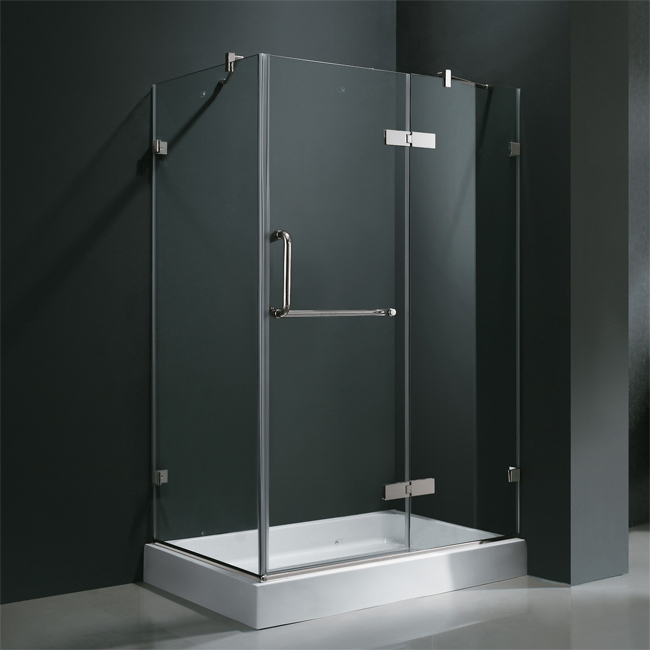 "Update your bathroom with this uniquely stylish and totally frameless VIGO rectangular-shaped shower enclosure Single water deflector redirects water toward the inside of the shower Clear side seals keep the door watertight Full-length magnetic catch allowing for door adjustment and waterproof protection Clear PVC side gasket installs vertically onto door to ensure a water-tight seal between door and side panel when the door is in the closed position 3/8"" Clear tempered glass ANSI Z97.1 certified Brushed nickel finished stainless steel and solid brass construction hardware has a VIGO lifetime guarantee to never rust Glass support plates are made of solid cast brass with all stainless steel moving parts to ensure superior quality and durability. Self closing hinge allows smooth closing of the door. Sealed hinges providing functionality and leak-proof protection Fixed arm support ensures wall anchoring and reinforces wall stability Stylized towel bar for a completely different look Right sided installation Overall dimensions: 38 1/4"" W x 30 1/4"" L x 73 1/3"" H Door swing 23"" Shower Tray: VG06019WHT3240R Constructed of acrylic with fiberglass reinforcement, this VIGO shower base features a double threshold, textured bottom for added safety Durable cross-linked cast acrylic shell is extremely scratch and stain resistant, yet renewable because the color goes all the way through the material Non-porous surface makes cleaning and sanitizing faster and more effective Multi-layered backing of thick fiberglass / resin- enclosed wood reinforcement to prevent flexing of floor pan At least 30% thicker and stronger than other makes Pre-leveled with integral tile flange on 2 sides to facilitate installation Right-hand drain configuration Textured bottom for extra safety Standard 3 1/2"" pre-drilled drain opening Overall dimensions: 40 1/4"" W x 32 3/8"" L x 5 7/8"" H Refer to model number: VG6011BNCL40WR All VIGO Shower Bases offer a 2 Year Limited Warranty and All VIGO Shower Doors offer a Limited Lifetime Warranty"